With over 150 acting credits we can say Jeff knows one thing or two about having a successful career as an actor. I first met Jeff when he was doing a play in London called ’12 Angry Men’, a show I got to see quite a few times and each time, Jeff’s acting was mesmerizing. Someone I am now honored to call a friend. So in this June issue of MilliOnAir, we wanted to feature someone who not only inspires people with his career in film, television and theater, but also his humanitarian efforts. I have a lot of respect for Jeff, not just as an actor but who he is as a human being and today we shall get to know him a little bit more. Jeff has been around for so long that it would be hard for me to mention just one of the movies or TV shows people know him from. From Silverado in the 80’s; The Lawnmower Man, The Marshall & The Contract in the 90’s; to of course Lost in the 2000’s. And the last few years we have seen him in TV hit series such as Chuck, Hawaii 5.0, Under The Dome, Justified, Texas Rising, Legends of Tomorrow and also starring in upcoming movies such as the mega budgeted “Alita: Battle Angel” from director Robert Rodriguez and producer James Cameron for Fox, “Sunset Glory: Doolittle’s Heroes” the epic WWII American/Chinese coproduction and “Too Late” the award winning film starring opposite John Hawkes. For anyone who appreciates the art & craft that is acting, we will all agree that there is something very special about Jeff Fahey. And I’m not talking just about the trademark piercing blue eyes that continue to make ladies hearts flutter (o0ps! did I say that out loud? ), I’m talking about the way Jeff embraces and becomes a character. Going back to when I saw Jeff live during ’12 Angry Men’, I still remember his stellar performances and how you could hear a pin drop during the entire play. I would get goosebumps from seeing the emotion in his eyes. He transported me to a different world. I truly felt like I was part of the production and I was living the performance myself. When you are able to feel that, you know you are in the presence of a truly magnificent actor who has honed his craft to a level not many reach. We could probably dedicate a full magazine to talk all things Jeff and it would most likely not be enough! Now time to enjoy this inspirational interview with the iconic legend that is Jeff Fahey. You were one of 13 children growing up. What would you say was the best part of growing up surrounded by such a large family? Being from a family of 13 was, in many ways, such a gift. Aside from financial struggles that many families of all sizes go through. The gift was realized years later and still is to this day…And that was being one of many, 7 brothers and 5 sisters, with different ideas, opinions, feelings and experiences. When we’re young we look at others opinions as confusion and frustration, and might take so many things personally and years later realize it was only the beginning stages of individual growth of clarity and variations. That is interesting, because I grew up as an only child, so I could not even begin to imagine what it was like to be surrounded by so many people. Before you got into acting, you traveled the world doing odd jobs here are there. Can you tell us what you did and what you learned from that experience at such young age? Working all kinds of odd jobs from Sword Fishing in the North Atlantic to Construction sites in the Middle East, driving an Ambulance in Germany, and returning to all these places years later when I was either working in some of these same locations in films or wanting to return to see the changes over the years and, it’s nice to be able to experience a place again with a few dollars in your pocket this time around. What have I learned from all these experiences, is a very short question that has an endless answer that I hope will go on forever. That was a bit esoteric for an answer to your question. One of the many things I have learned is, yes there are very bad people near us and out around the world, but much more importantly I would say there are by far great, wonderful, giving, caring people, near all of us every day all around the world. Correct Jeff, now I understand you won a full scholarship to dance with the Joffrey Ballet in New York City? What did ballet teach you? My introduction to dance came through acting. I first started studying acting at the Studio Arena Theatre in Buffalo, New York in an acting group called “The Now Theatre Ensemble” and we were working in the Grotowski Technique of Experimental Theatre, which is very physical theatre. It was through this acting technique that I was introduced and learned to appreciate Ballet and classical music, Martha Gramm and Modern dance, Alvin Ailey Dance Company, Dance Theatre of Harlem, and all other studies of movement. The reason for study of movement and dance for me was to apply it to acting, rather than study to become a dancer. The years that I did study movement have stayed with me through my life and career as an actor in so many ways. It gave me a sense of daily discipline that I still apply to my work and life. The idea of working each and every day for hours in a classroom, or studio, or on your own, to create an inner strength of mind and body that is necessary for the performer to then be on stage or screen and be at that place and feeling of freedom, where the work does not show, but rather flows with ease. Hopefully I’m able to reach that place every once in a while. After traveling the world for years, what made you become an actor? I never really thought about or wanted to be an actor, and I was back in Buffalo after many years of traveling. After being fired from a job as a shoe salesman, I was walking down the street that afternoon past the Studio Arena Theatre, I had never been in an actual theatre, movie theaters yes, but I HAD never seen a play… The door to the theatre was open, so I walked in and there was a class going on, on the stage, I snuck in and sat in the back of the theatre and watched this strange but very interesting group of people acting out these moments. Long story short, I started taking classes that week and then became a member of the theatre group and actually was in a play 4 weeks later, first time on stage. I was actually in a play before I even saw a play. I was 22 years old and that day was the beginning of what has been a big part of my life for the last 42 years as an actor. The reason I continued and have stayed in the business is because it’s always allowed me to have the freedom of adventure and allowed me to explore storytelling and have the daily challenge, and constant change of working environment. It’s a wonderful feeling to have challenges and freedom at the same time. So, let’s talk about the early days in your career. There are many people out there who want to become actors but give up too soon. what advice do you have for anyone who is just starting out and feels overwhelmed by the industry? I would say that if you can find a way within yourself to feel secure in an insecure environment and industry, you’ve discovered an important part of the formula. There are no guarantees, so rather than be overwhelmed by the challenges, embrace the unknown as an adventure . I think it’s important to ask yourself why you want to be an actor…. Whether it’s one, or a few of these, or all, or none of these I say embrace your reason, don’t be embarrassed, they’re all legitimate. Whatever your reason is, it’s okay. Let it be your strength and your driving force. Wow, those were some incredible wise words. Very well said. It’s hard for me to select just a few movies or TV series to talk about, so how about the 80’s. Most people would say ‘ Lawnmower Man’. What films would you say you remember the most from that period and are there any stories you can share with us? Well first of all that is a great question because now I have to try to remember! (We both laugh) Let’s see, there were some fascinating things that happened in the 80’s. In the late 70’s early 80’s there was Broadway, the revival of Brigadoon and West Side Story, Oklahoma and then in 83 there was an introduction of this whole new world of film, I did my first movie which was a western and I love westerns, and that was Silverado. And then after that the live teleplay called The Execution of Raymond Graham, which was about the last two hours of a convict on death row, we did it live on ABC with 14 cameras. That was the first and last live television show on ABC in the last 50 years. That was very exciting, we rehearsed for a couple of weeks like a play then we went live at exactly 9pm to 11pm. The director would come down during commercial and would say ‘we were 2 minutes long, so tighten up the next scenes’, the camera would come back on and we’d go live. Then we’d be short and the director would say stretch the next scene so we were constantly having to adjust to the time according to the real clock. So that was I believe 1985 and from there went to London’s West End to do the play Orphans with Albert Finney, a dear friend and one of the great actors of the last few generations. Orphans was directed by Gary Sinise, and then from there, yes, the ‘Lawnmower Man’ happened and then at the end of the 80’s was ‘White Hunter Black Heart’ with Clint Eastwood so the 80’s they were quite a time. The end of the 80’s, early 90’s was ‘White Hunter Black Heart’ with Clint Eastwood as I mentioned and I learned so much from working with Clint. During that period, I learned a lot from some amazing filmmakers as I was making 4-5 films a year. I think by that time I was beginning to realize not only the great directors and actors, writers & producers I was working with but I began to appreciate my work process. The experience was becoming much richer in the sense of the craft and the technique. The thing is, you have four decades of all these different movies and things you’ve done and pioneering some things to pick and choose just a few is difficult, otherwise we could have a whole magazine issue talking about each of your experiences! It was only logical that we spoke about Lost for the 2000’s! You have been praised many times for your role in Lost and I even remember people coming up to you with Lost posters in London for you to sign at the end of your play. How do you remember Lost? Why do you think it’s still such a big phenomenon worldwide? As you know it was a huge show played all over the world and it was a No1 show in so many different countries and the viewership was millions upon millions. That in and of itself was an incredible experience and phenomena and to be part of that was amazing. One can spend years involved in the work and the process and then when something like that happens you don’t quite understand it. You dig it and you roll with it and I think it was one of those shows that it just found its niche and time and place. The audience embraced it and embraced all the characters. The demographics were quite varied but I honestly can’t explain the phenomenon and I think there will be quite a few people that I’ve worked with that can’t give a specific answer. Lost meant so many different things to the varied audience, we could talk to 10 people and have completely different views, that is one of the many things that makes something intriguing and entertaining. As for the finale of the 6 season from everything I hear people say, it seems half the viewers in the world liked it very much and half the viewers were disappointed. That alone tells you that it meant different things to people. It gave everybody different answers. It’s just one of those great wonderful times in TV history where a TV show gels with that waiting audience all over the world and I feel very fortunate and happy that I was part of that. Met some great people and had a great working experience for the 3 seasons that I was on. At the end of 2014 it was announced that you would join the cast of the very successful TV Series Justified. What was it like to be part of that final season? It was fantastic. I loved working with the cast. Walton Goggins was a great man, what a fabulous actor he is and Joelle Carter a wonderful person and great actress. I loved working with both of them and all the different directors. It was a great experience. Over the last few years we have seen you appear in some of the most known TV series of the decade which shows the world can’t get enough of Jeff Fahey and there is still plenty more to come. As a veteran, someone who has been around for 40 years in the industry, can you tell us what is the secret to having longevity in an industry that is forever changing? I would say part of it is definitely luck. Luck is part of the success in this industry. Hopefully one can deliver when the door is open but many times it is luck that gets the door open and then all your jazz is on the line and you gotta rock and roll baby. I say dig the adventure and I think as you go on, you take things less personal. Learn your craft, show up and deliver and hopefully realize that you are not more special than anybody else. You are just lucky that you got a special job that you should appreciate and rather than expect someone to bring you a coffee go and get someone else a cup of coffee instead. I love that last statement! Now what would you say has been your most challenging role so far in your acting career? Ha! I did not expect that answer! That is different! That is the most difficult one; once you are over that the rest is not so bad. Talking about theatre, a platform that requires a different level of acting. Talk to us about what have been some of your most memorable plays. I would say the two plays that I did in London. Back in the 80’s Orphans and then 28 years later 2013 ‘12 Angry Men’. For me it was such a gift when Albert Finney and his wife Pene came to see 12 Angry Men. That was the night that Tom Hanks & Rita Wilson came and I had arranged for all of them to sit together then we all went for dinner. Wonderful friends that I have met over the years that came to see the show, you came to see the show, how many times, 10? Yes! Something like that, I came bringing different people and each time it was like I was watching it for the first time. It did get to me. Your emotion, the crying, the audience was immersed in the story each and every time. I feel very fortunate to have seen you in that play live. I still get Goosebumps if I close my eyes and think back on those nights. Each time I got pulled in more and more. So, it is great to know it is one of your most memorable plays. I’m going to New York next week to do a reading of a new play “The Husk” written by my friend Jake Quinn and hopefully we’ll be doing that play in November-December on Off Broadway. Now Jeff, not everyone is aware of this, but you have been a longtime humanitarian advocate. From helping orphanages & schools to refugees. You are part of America Broad Media, Project Passerine, you are also a member of the Advisory Board of Friends Forever USA and in recognition for your efforts a few years ago you were designated as The Global Ambassador of the US Committee for Refugees and Immigrants (USCRI). What can you tell us about these subjects you are so passionate about? There is so much I can and would like to tell you about them. The best thing would be for people to check the links we are sharing then we’ll do a follow up on our next interview in MilliOnAir. That is a great idea Jeff and yes, we will for sure be doing some follow ups with you! Too many stories to share with our readers, I know I want to continue hearing the adventures that are yet to come. To all our readers, Jeff is always very humble when it comes to his humanitarian work but I really wanted to make everyone aware of the amazing projects that he does because I know more people want to get involved in causes and they don’t know how. As Jeff mentioned we will be doing a follow up very soon and more news will be released! Otherwise this interview could keep going forever. So, at the bottom of this interview you will find all links to the projects. Jeff, from the days hanging out in London, I always remember how much people respect you and how you always listen to them. What do you value most in people? Integrity, truth, passion for life, honor and humor, I look for these in others and try to hold onto that in myself. My whole life is spare time! Working in the industry and the other work I do it all becomes one, I really have been fortunate and blessed to have this great adventure and mix these worlds together in my life. Who do you get inspired by? I get inspired by life and death and I say that not to be dark, or to make light of tragedy in the world. The more we live, and everyone has their tragedies, some have far more tragedy than others and some are fortunate to have far more joy than most. But I think one of the things that helps or forces us to grow and change is that as we grow older we experience birth more and it gives us this great joy, whether it is someone close to you or someone with a growing family or a friend having a child for the first time and at the same time we experience more death because we are more aware of life whether it is in a conflict area, a close friend that has just passed or not even someone close to you but you are aware that someone else is having that experience of pain and loss. Both of these things have made me appreciate life more each day, each year. And it’s given me more drive to do more and to appreciate every single thing more. With all the experience and wisdom you have gathered so far, what advice would you give to your younger self? Be cool brother, be cool! Ha! I think I’m going to have to steal that line! 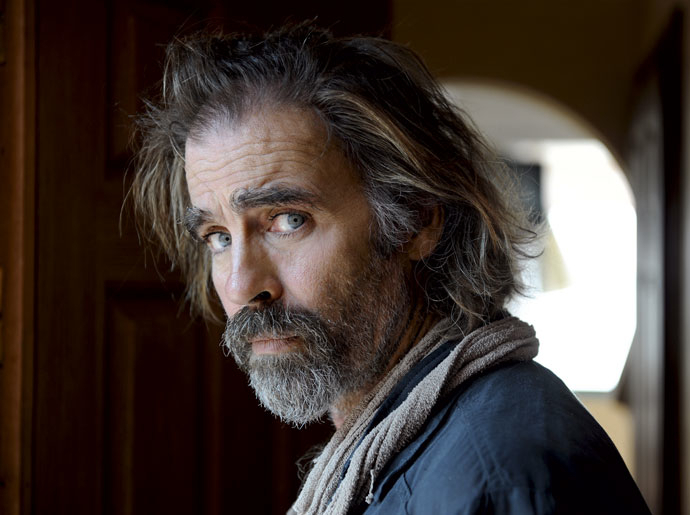 So what is next for Jeff Fahey? Can you share with us what you are working on? I just formed a film/TV Production company with my partners Natalia Rotenberg, Dmitry Chebotarev and Laura Hypponen called “Amber Snow”. We’re developing a project with 2 time Oscar nominated director Roland Joffe. I am going to New York to hopefully get the new play I mentioned earlier, The Husk, on its feet for off Broadway in the fall, then heading back to the Middle East in a couple of weeks to continue working with AAM, some programs we are setting up for young film writers in Jordan and a couple of other countries, I’ll have some other news when we do a follow up about an international film school and Roland Joffe and myself. But right now I am currently in Vancouver filming and I’ll be going to Serbia next month to do a film. Thank you so much for your time. It is always a pleasure catching up with you as always. We can’t wait to see your next projects and readers I’ll catch up with Jeff again very soon so he can continue to share his journey. So there you have it folks, we got to know Jeff a little bit more and here at MilliOnAir, he will always have our support. Jeff Fahey and his piercing blue eyes will continue to inspire many generations to come with his charisma, work ethic, drive, vision and passion for the way he lives life each day not just for himself but for the many he continues to empower in life. As I always say, Keep it Real! And as mentioned here are some links to his Humanitarian efforts & projects. We will be doing a more in depth follow up on this soon….